I love thrift stores, vintage craft books and other things. One bags up fabric remnants and sells them for 4.99 which is very handy when you have a daughter who can spend hours hand sewing little dolls and other things. I found the above amazing sheet of sweetness Saturday after we got the car back. My darling husband actually flinched when he saw it. I've been debating what to do with it, I think I'll make grocery bags, but on Facebook, my good friend Rebecca suggested I hit it with glitter and turn it into my battle flag. My Naet refined the idea further with this suggestion "Haha, I love that idea ... glitter the fluck out of it and add a pink skull & crossbones. 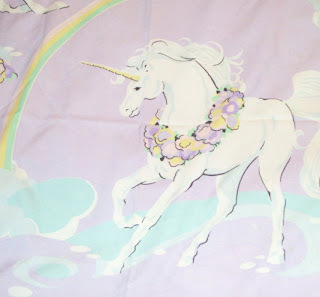 A sparkly rainbow unicorn jolly roger flag :)"
I love that idea too. But it will probably wind up being very cute grocery bags. 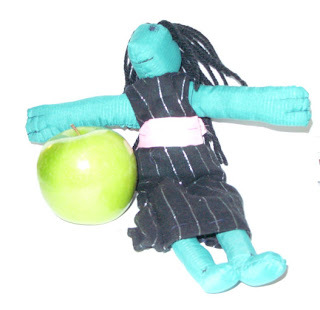 My daughter, The Turnip, makes handmade dolls. She's too impatient mostly for careful tiny backstitching, and doesn't follow or make patterns despite my pleading for patterns I could post here of her amazing creations. She embroiders eyes on them or she uses permanent markers to draw them on, occasionally she uses buttons. Most of them are fan based somehow, but some are just creations. For Christmas, she made all of us except Dad, dolls. She made Mike one based on one of his favorite comics, she made me a green witch, and she made William one based on a video game he likes. For Dad, she made him a cell phone case designed after the uniforms worn in ST:TNG. She loves to sew. She loves thrift stores for sweaters to make things with, her own wardrobe (she's fond of suits, ties and button down oxford shirts) and fabric for her dolls. This is the doll she made me for Christmas.